By studying a triple planetary system that resembles a scaled-up version of our own Sun’s family of planets, astronomers have been able to obtain the first direct spectrum — the “chemical fingerprint”  — of a planet orbiting a distant star , thus bringing new insights into the planet's formation and composition. The result represents a milestone in the search for life elsewhere in the Universe. 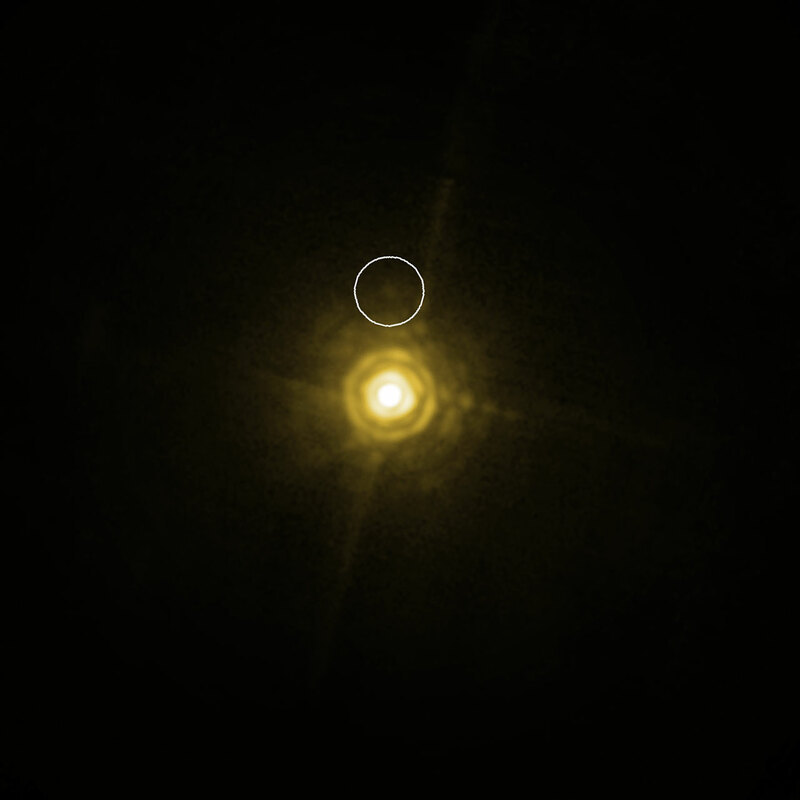 The researchers obtained the spectrum of a giant exoplanet that orbits the bright, very young star HR 8799. The system is at about 130 light-years from Earth. The star has 1.5 times the mass of the Sun, and hosts a planetary system that resembles a scaled-up model of our own Solar System. Three giant companion planets were detected in 2008 by another team of researchers, with masses between 7 and 10 times that of Jupiter. They are between 20 and 70 times as far from their host star as the Earth is from the Sun; the system also features two belts of smaller objects, similar to our Solar System's asteroid and Kuiper belts. As the host star is several thousand times brighter than the planet, this is a remarkable achievement. “It's like trying to see what a candle is made of, by observing it from a distance of two kilometres when it’s next to a blindingly bright 300 Watt lamp,” says Janson. The discovery was made possible by the infrared instrument NACO, mounted on the VLT, and relied heavily on the extraordinary capabilities of the instrument’s adaptive optics system . Even more precise images and spectra of giant exoplanets are expected both from the next generation instrument SPHERE, to be installed on the VLT in 2011, and from the European Extremely Large Telescope. As every rainbow demonstrates, white light can be split up into different colours. 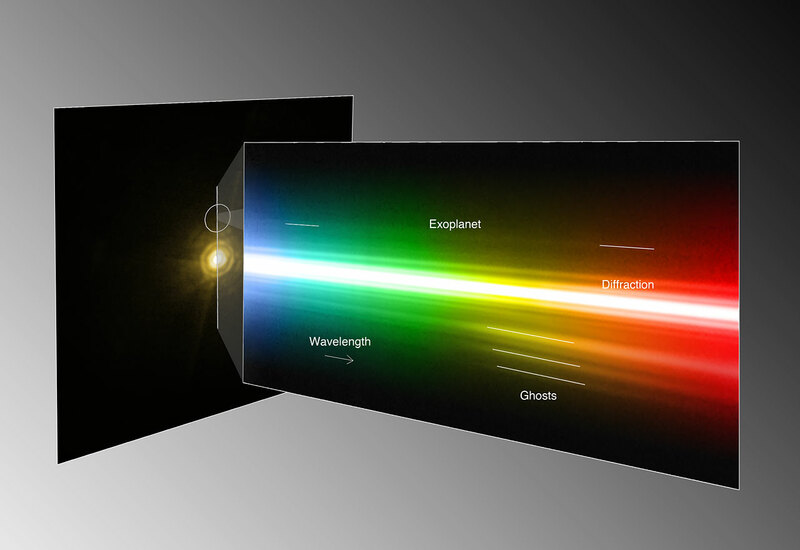 Astronomers artificially split up the light they receive from distant objects into its different colours (or “wavelengths”). However, where we distinguish five or six rainbow colours, astronomers map hundreds of finely nuanced colours, producing a spectrum — a record of the different amounts of light the object emits in each narrow colour band. The details of the spectrum — more light emitted at some colours, less light at others — provide tell-tale signs about the chemical composition of the matter producing the light. 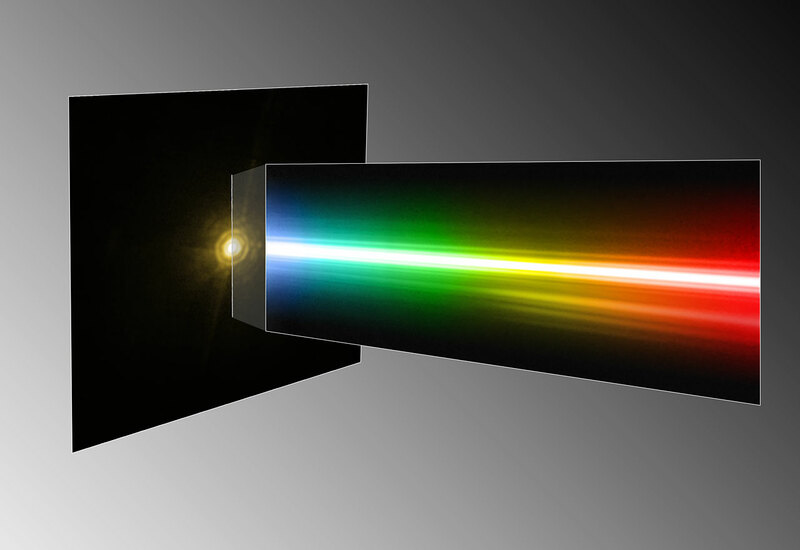 This makes spectroscopy, the recording of spectra, an important investigative tool in astronomy. In 2004, astronomers used NACO on the VLT to obtain an image and a spectrum of a 5 Jupiter mass object around a brown dwarf — a “failed star”. 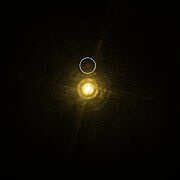 It is however thought that the pair probably formed together, like a petite stellar binary, instead of the companion forming in the disc around the brown dwarf, like a star–planet system (see eso0428, eso0515 and eso0619). This research was presented in a paper in press as a Letter to the Astrophysical Journal (“Spatially resolved spectroscopy of the exoplanet HR 8799 c”, by M. Janson et al.). The team is composed of M. Janson (University of Toronto, Canada), C. Bergfors, M. Goto, W. Brandner (Max-Planck-Institute for Astronomy, Heidelberg, Germany) and D. Lafrenière (University of Montreal, Canada). Preparatory data were taken with the IRCS instrument at the Subaru telescope. ESO, the European Southern Observatory, is the foremost intergovernmental astronomy organisation in Europe and the world’s most productive astronomical observatory. It is supported by 14 countries: Austria, Belgium, the Czech Republic, Denmark, France, Finland, Germany, Italy, the Netherlands, Portugal, Spain, Sweden, Switzerland and the United Kingdom. ESO carries out an ambitious programme focused on the design, construction and operation of powerful ground-based observing facilities enabling astronomers to make important scientific discoveries. ESO also plays a leading role in promoting and organising cooperation in astronomical research. ESO operates three unique world-class observing sites in Chile: La Silla, Paranal and Chajnantor. At Paranal, ESO operates the Very Large Telescope, the world’s most advanced visible-light astronomical observatory, and VISTA, the world’s largest survey telescope. ESO is the European partner of a revolutionary astronomical telescope ALMA, the largest astronomical project in existence. ESO is currently planning a 42-metre European Extremely Large optical/near-infrared Telescope, the E-ELT, which will become “the world’s biggest eye on the sky”.